This is one of the picture that I took when my little girl gets the chance to celebrate her advance party in the Philippines. My daughter’s birthday is actually last August. I decided and she wants to celebrate her birthday with her cousins and neighbors. We held her birthday at the Jollibee. Filipinos love Jollibee. You should ask a kid if she/he wants to eat at Jollibee. You definitely will not get a NO answer. Most of these kids are her cousins. This is just some of her cousins. Can you imagine if everybody comes in her party? I am sure that it will cost me a lot of money. My little girl is very happy. September begins the Christmas anticipation in the Philippines. You can even see Christmas decorations in the store. I am planning to send my nieces and nephews as Christmas gifts for them. I know that clothes and toys are expensive in the Philippines. Everybody cannot afford to get their kids clothes or toys for Christmas. I am planning of enrolling a lay-away. I want to buy many gifts for my nieces and nephews. I am sure that I can fill the big box and send it to them next month. The big box will take two months to arrive. I hope they receive the big box by December. They could open it on Christmas Day. What about you? How do you buy gifts for everybody? Have you tried the lay-away? Is their lay-away available in your store? 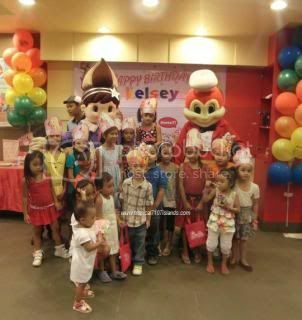 This entry was posted in clothing, gift, occasion, services, shopping, store, toys, travel and tagged birthday, Jollibee, lay-away. Bookmark the permalink.